The good; I absolutely love this premise. This reminds me of the movies in the 80s (The Neverending Story, Flight of the Navigator, Labyrinth, Explorers…), it’s about a child being a fish out of water in a new fantastical world. The character journey of Ren coupled with Kumatetsu is really well done and earnest. Not only is this story about Ren being a fish out of water, but once Kumatetsu is introduced it becomes an odd couple story, and the combination works wonderfully. The animation is beautiful. The combat scenes are very well done and so are the smaller scenes, an example of this would be the scenes of scenery. The busy life of Tokyo looks amazing and it’s just people crossing the street, there’s also a market scene in the Beast Kingdom that’s equally amazing. The bad; the second act. This is where a lot of films suffer, but this one in particular seems to take a grinding halt because we travel back to the human world. Not sure why so much time was spent here, it seems like the movie had a third act climax in the second act, but then it kept going. It also needed to make the Beast Kingdom a little more fantastical and different from the human world. Overall, a beautifully executed film. The film really works hard to achieve its ending, and I appreciate that. It’s very much like Hosoda’s previous film Summer Wars, if anything he knows how to earn an ending. 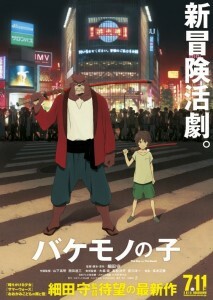 I was lucky enough to see The Boy and the Beast in the theatres. It was the second highest grossing film of 2015 in Japan, so check it out if you can.